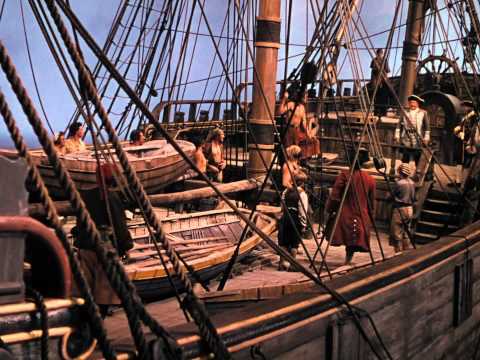 I have never seen this picture before which is taken from above the set of the Hispaniola on the sound stage at Denham Film Studios. 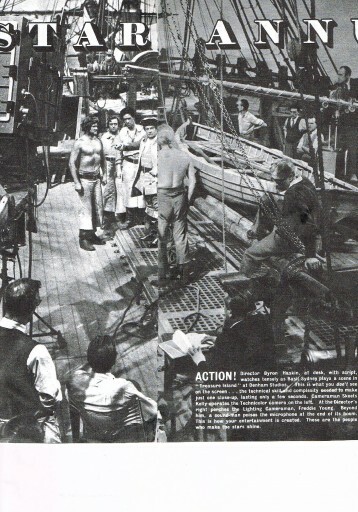 The photo above was taken during the shooting of Treasure Island, at Denham Film Studios in England which was Walt Disney’s first all-live-action feature, made in England in 1949 – released in 1950. The director, Byron Haskin, and his assistant, Mark Evans, are seated at the right, in front of the wheel. On the crane at left are Freddie Young, the legendary cinematographer and camera operator Skeets Kelly. 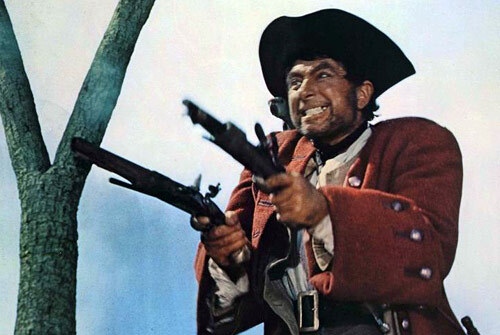 Robert Newton was the actor chosen to play that key role of Long John Silver. His performance wasn’t just the definitive portrayal of Long John Silver, it became cemented in the public’s mind as what a pirate should be. A great character in the hands of a great performer. Robert Newton brings enormous charisma to the role, and because of it, the audience is always left guessing (just as Jim is) to the character’s true nature. He’s a bad man to be sure, but is there also kindness in him? Somehow you just cannot help but like him.